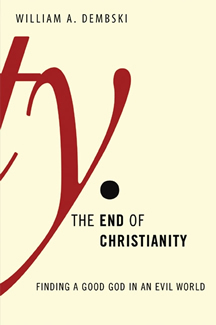 Entering the conversation, Dembski’s provocative The End of Christianity embraces the challenge to formulate a theodicy that is both faithful to Christian orthodoxy and credible to the new mental environment. He writes to make peace with three claims: (1) God by wisdom created the world out of nothing. (2) God exercises particular providence in the world. (3) All evil in the world ultimately traces back to human sin. In the process, Dembski brings the reader to a fresh understanding of what the end (result) of Christianity” really means: the radical realignment of our thinking so that we see God’s goodness in creation despite the distorting effects of sin in our hearts and evil in the world. A mathematician and philosopher, William A. Dembski is Research Professor in Philosophy at Southwestern Baptist Theological Seminary in Ft. Worth, TX. He is also a senior fellow with Discovery Institute's Center for Science and Culture in Seattle. Previously he was the Carl F.H. Henry Professor of Theology and Science at The Southern Baptist Theological Seminary in Louisville, where he founded its Center for Theology and Science. Before that he was Associate Research Professor in the Conceptual Foundations of Science at Baylor University, where he also headed the first intelligent design think-tank at a major research university: The Michael Polanyi Center. Dr. Dembski has taught at Northwestern University, the University of Notre Dame, and the University of Dallas. He has done postdoctoral work in mathematics at MIT, in physics at the University of Chicago, and in computer science at Princeton University. A graduate of the University of Illinois at Chicago where he earned a B.A. in psychology, and M.S. in statistics, and a Ph.D. in philosophy, he also received a doctorate in mathematics from the University of Chicago in 1988 and a master of divinity degree from Princeton Theological Seminary in 1996. He has held National Science graduate and postdoctoral fellowships. As interest in intelligent design has grown in the wider culture, Dr. Dembski has assumed the role of public intellectual. In addition to lecturing around the world at colleges and universities, he is frequently interviewed on the radio and television. His work has been cited in numerous newspaper and magazine articles, including three front page stories in the New York Times as well as the August 15, 2005 Time magazine cover story on intelligent design. He has appeared on the BBC, NPR (Diane Rehm, etc. ), PBS, CSPAN2, CNN, Fox News, ABC Nightline, and the Daily Show with Jon Stewart.